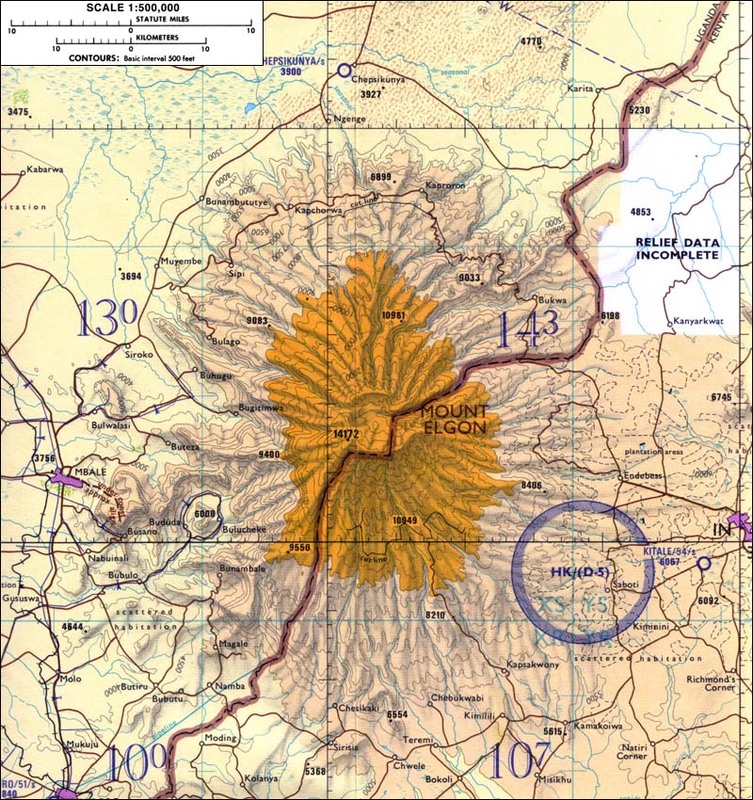 14178 ft (4321 m) . 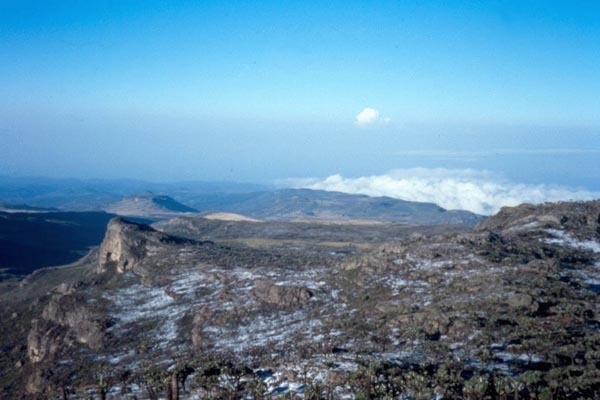 Mount Elgon is a huge, ancient, and eroded stratovolcano which sits astride the Uganda-Kenya border. Although not the tallest of the isolated volcanoes of East Africa, it is among the largest in volume, rising up from a base over 50 miles (80 km) in diameter on the plains at about 4000 ft (1200 m) elevation. 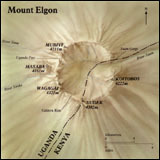 Elgon is topped by a caldera about 5 miles (8 km) in diameter, with several high points over 13000 ft (4000 m) along the rim. 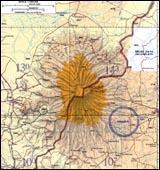 Elgon is noted for its unique Afro-alpine trees and plants, and for the many caves in its mid-elevation slopes, where elephants and other large animals can often be found eating mineral salts. These caves are not lava tubes, since Elgon has few suitable lava flows, but are instead eroded from the volcanic tuff (welded ash flows) which make up the bulk of Elgon's volume (digging by elephants may also contribute to the enlargement of the caves). 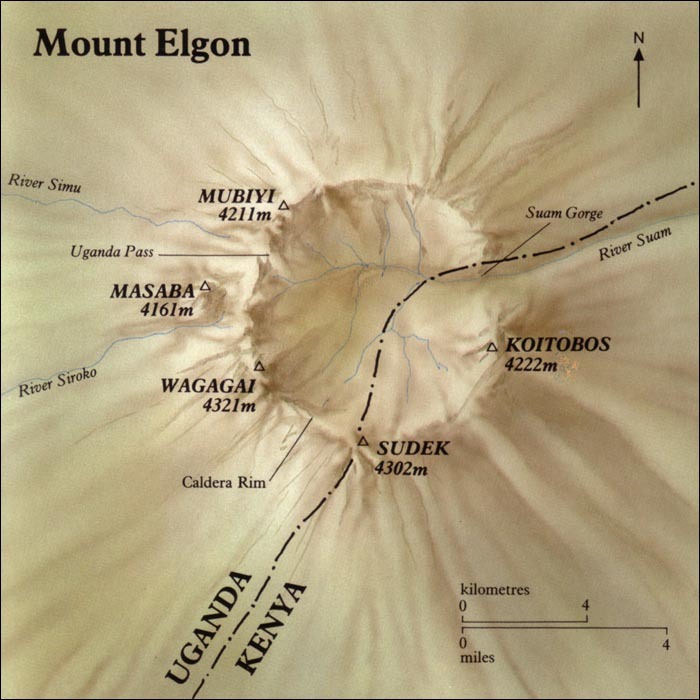 Although not presently glaciated, during the Ice Ages Mount Elgon supported numerous glaciers which extended down below 11000 ft (3400 m). Occasional snows still fall on the higher slopes, but accumulations do not last for long. With good timing, it may just be possible to ski a short run someplace near the caldera rim after a major storm.